Trying to find my sense of humor at lunch with my sister today, I read my fortune cookie. “Get ready to do something daring” before passing it to Cindy. We both laughed and laughed. 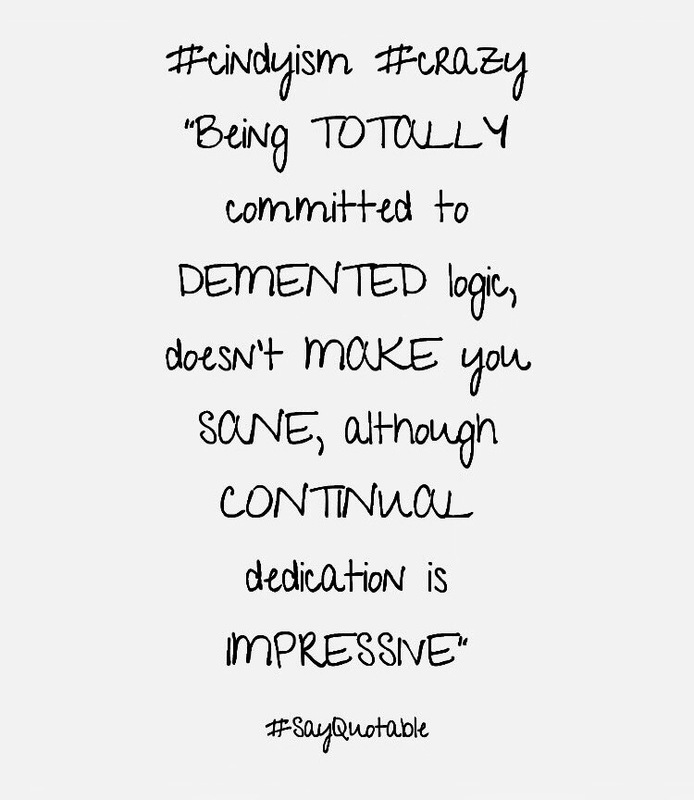 I “do something daring” on a regular basis by simply getting out of bed to start my day ya all. Although I’ve never considered myself to be “daring” I’m certainly not afraid to either try something new or take a chance on a bartered item. Without risk- there are no rewards. For months now, Cindy and I have bounced from Client Meetings and Events to Psych Wards. Having one family member in a Psych Ward is stressful but, three? My twin and I have tried to keep our sense of humor regarding this unexpected development. Eight months ago, my niece was the first to wind up committed. Six commitments later, she is once again in a treatment facility. It’s difficult to be hopeful that treatment will help my niece. Why? Years of rehab and now, months of “Psych Stints” for my niece have proven to our family that unless Stephaney chooses to change- she won’t. 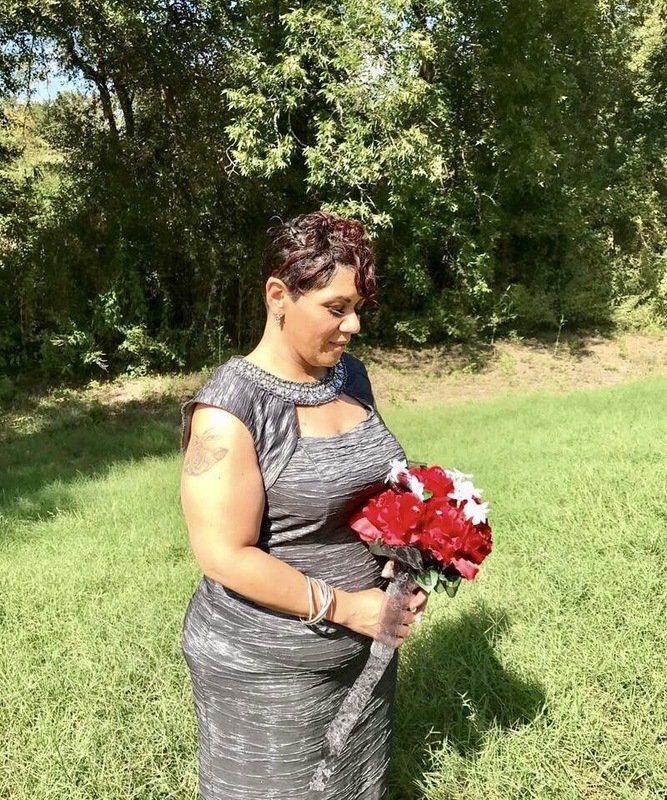 From performing Prison or Jail Weddings to bartering Event Services that range from Family Reunions, Estate Liquidations, Baptisms, Memorials and more creative requests through The Pawning Planners to refurbishing trades and listing them at Texas Twins Treasures, time is something I have very little of. Spending large amounts of time either being screened in for visitation at a Psych Ward or fielding yet another wild text from my dad while trying to “act normal” in my now abnormal world of chaos is a tightrope of emotion for not only me but, also my twin sister. For those following the unexpected trials and tribulations of the past 8 or so months with my niece, Stephaney, Cindy and I are thrilled to announce that she finally checked herself into long term treatment this morning on her own. We had rejoiced about this far too quickly. As usual. The many times my sister has moved Stephaney home to face yet another relapse are beyond count at this point. It’s now time for us to stop enabling her and force her to empower herself by making good choices and learning from her bad ones. Meanwhile, Maryssa has been doing well in treatment to manage anger issues. Makenna and I are going to visit her this evening at Mesa Springs. 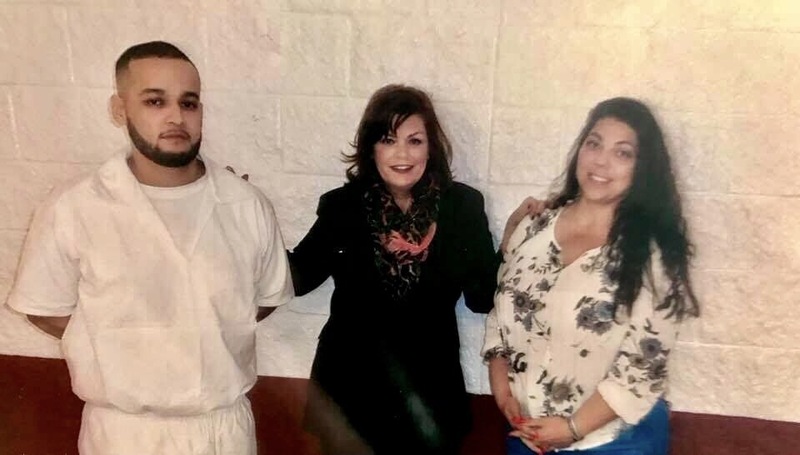 Our family group meeting was last Friday with Maryssa and, my dad sent a few wild texts that Cindy reviewed on our way to TDCJ Beto Unit that we are having a harder and harder time answering. From dad’s sister calling to suggest her views to others dealing with aging Parents, nothing could have prepared us for the past few months of dad being convinced people are living in his attic, nothing. I don’t answer texts driving to Prisons or Events, Cindy normally does for me as well as emails. The communications with dad are becoming so wild that if anyone read our phones, they might assume we were crazy with a few of the responses we’ve given. “Going along” with dad makes for some highly interesting conversations! Dad’s girlfriend from the Wellbridge Behavioral Unit had left a few days ago and dad had called her about missing bullets for his 38. Somehow, my dad is convinced she took them. Reading her message, Cindy and I both wondered if dad would be upset should we respond. She had friended us on FB last week. I decided to answer and ask about the bullets my dad was so upset about. Shocked that my father had been shooting in the house again, my sister and I decided that perhaps the girlfriend didn’t take the bullets because my dad used them to shoot the roof? Cindy and I have no idea how to convince my father that no one is stalking his house. For months, we’ve looked through his attic and tried to convince him that no one is shooting chemicals through his air vents. When you have someone convinced a conspiracy is going on, nothing you say or do will convince them otherwise. Things at my dads house “heated up” months ago when he thought his neighbor had killed his grass. Thinking the neighbor somehow found a way to get into my dads attic, I’ve been up there a million times to double check. My dad has always been independent and self sufficient. We have no idea why this is going on. My sister and I don’t understand it. Our family members have plenty of advice but haven’t been to dads house or done anything to help with this problem. It’s easy to give advice when you aren’t doing anything to solve the problem. Since Monday- Friday we are on the road driving to Texas Prisons or meeting clients, dad’s texts and phone calls are almost always when we are addressing work related obligations. I’m certain my brother and other relatives calling with suggestions might assume that Cindy or I aren’t “making enough time for dad” but, the truth is that we are the only ones making time for him. Seriously. Other than dad’s social worker, my dad’s girlfriend and us, my dad has NO ONE other than Cindy and I to regularly check on him. But, other relatives have plenty of bad advice and no experience with this type of situation. The issues with dad have deteriorated so much the past five months that he’s now even contacted the FBI regarding being stalked in his home. I’ve advised my brother of the situation but, like us he has no idea how to solve the problem. Cindy and I have suggested a visit to our brother and his wife in a North Carolina in the hopes that a change of scenery will help dad. Calling the police last month to have them check dad’s house for intruders, my father had no idea that the bullet holes in his ceiling would get him committed. By the time my sister and I arrived, it was far too late for us or anyone else to convince the police that dad wasn’t crazy. For months now and nearly a year, predictability has flown out the window. Why? My family. From my dad and his conspiracy theories to my niece relapsing over and over to such an extent that she is now on her 7th mental commitment, to my grandniece acting out, Cindy and I are overwhelmed “trying to superglue our family into some resemblance of normality!” My grandniece, Makenna told me yesterday “you and Meme keep trying to superglue this family but, like a broken teacup, it won’t hold up when you try to put anything in it, everything keeps leaking back out.” Sadly, Makenna’s observation was accurate. The only stability in my life is my work and businesses. Clients give Cindy and I a break from the crazy reality our family members continue to bring to the table. Thank God I have businesses that occupy my time and my mind giving Cindy and I a break from family drama and chaos. I hate chaos as does my husband. I’m OCD and enjoy being in control but, with my family, I have no control. Cindy took Makenna to counseling this morning while I dealt with my usual round of emails and text messages. Makenna is dealing with depression that I’m certain is due to her mothers multiple relapses over the last eleven months. More broken promises and shattered expectations have caused Makenna to become so withdrawn that she refused to take calls from Stephaney at JPS. My grandniece, Maryssa has developed anger issues and her mother, Stephaney has at least finally sought treatment. But, will this time be the last time? With hundreds of promises to straighten up and fly right, I’m far too apprehensive to count the chickens before they hatch. I want to personally thank everyone who took the time to contact me regarding their own issues with a family member dealing with mental illness and/or addiction. It’s a helluva struggle to share your pain as I know all too well. A few of you have called me crying and asked that I keep your secret and in a few cases, your embarrassment over your own addictions private. As always, you can trust my confidence. I realize that sharing your struggles and successes at sobriety with me was very difficult and your reasons were to give us hope in a hopeless situation. Being transparent about the last months of our lives trying to hold this family together hasn’t been easy on Cindy or I. My hope is that our journey helps others to realize they aren’t alone. Dealing with family members in crisis often has the caretaker feeling as if they are floating in the ocean alone on a raft made out of toothpicks waiting on the next riptide to tear them in half. I know, it’s a difficult and heart wrenching decision to hope for the best while fearing for the worst. Knowing that many of you contacting me have made is through the storm gives me hope but, I’m fearful of yet another disappointment. I’m going to once again go over why we cannot Officiate at Denton County Jail although requests continue to pour in. Denton County uses Video Visitation. Performing a ceremony over an electronic device is illegal. Because of this issue, we cannot and will not Officiate a wedding unless both parties are present. 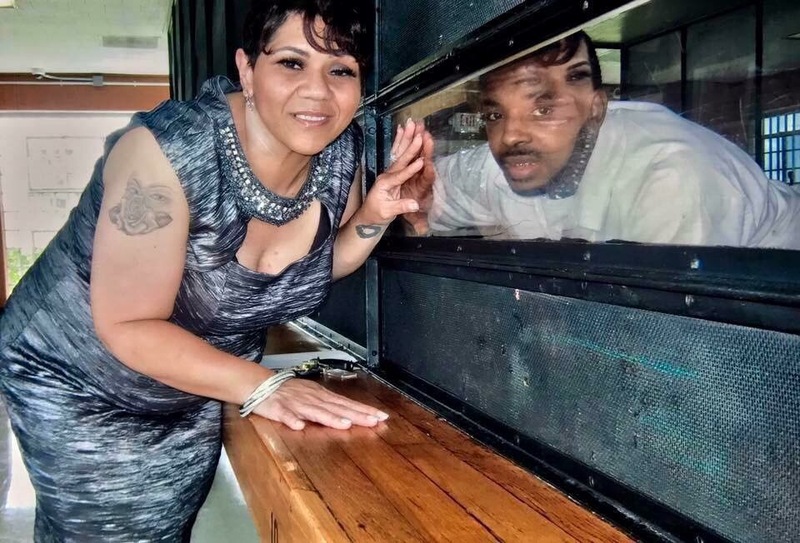 Even at Prisons where a glass separates the couple, the inmate can both hear and understand the ceremony. Formal Marriage Licenses are Affidavits of sorts signed by the Officiant who is swearing that a ceremony took place and where. Meaning both parties were present not on a video camera in another room, state or location. Please be aware that we strictly follow any and all legal guidelines pertaining to marriage and will not make exceptions. If video visitation is not disclosed prior to the wedding, we will decline to Officiate the ceremony. Period. Last night, one person began texting me at 6PM- 9PM that had been given my name by Hodge Unit. I’m at TDCJ Hodge Unit tomorrow morning to Officiate a wedding. 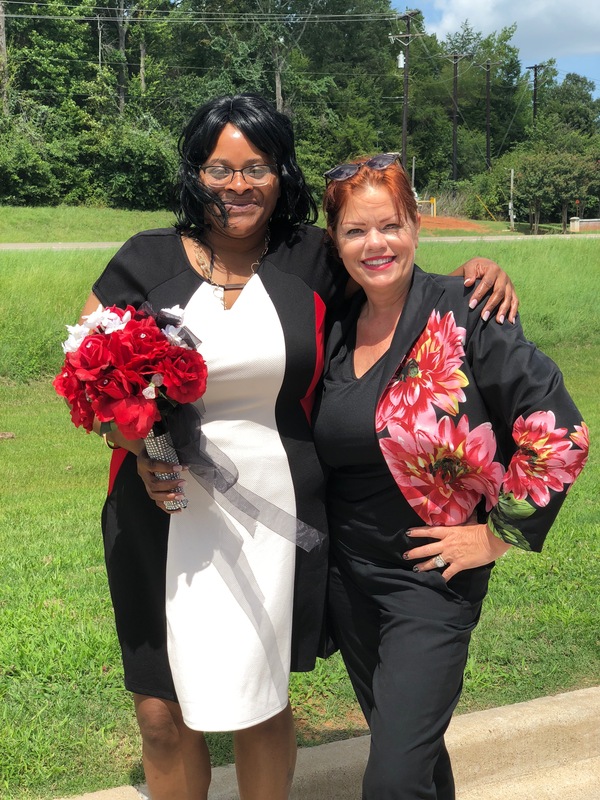 The reason she was given my name by the Unit was that the other Officiant wasn’t responding to emails or texts from her own client. The prospective client was obviously upset and seeking a reliable Officiant. My stellar reputation was hard earned and because of it, I have a huge amount of referral based TDCJ Clients. 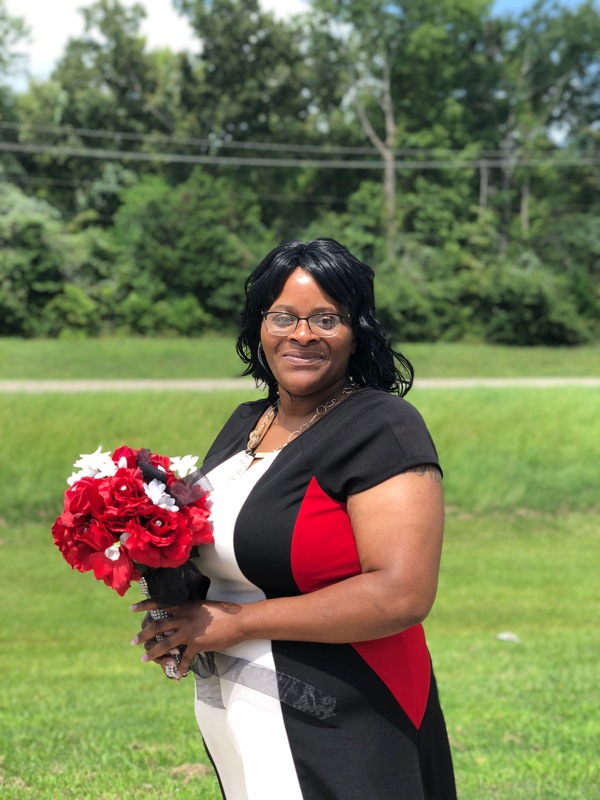 The many questions about hiring the wrong Officiant continue to flood my life by people like Tamitha who paid someone in good faith that took advantage of their trust. If you are having problems communicating with your Officiant then you have a bigger problem than you realize. 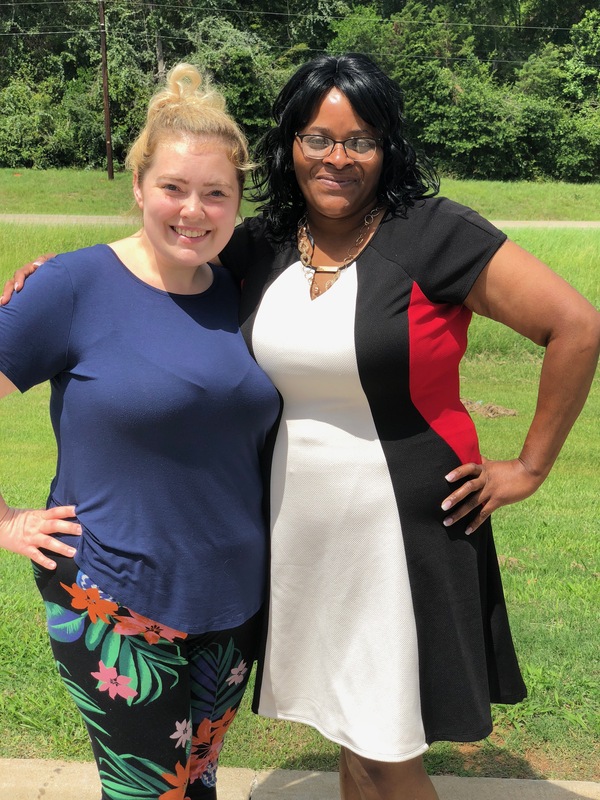 Tamitha has decided to hire someone she can trust for her TDCJ Wedding, me. I cannot stress the importance of finding someone reliable enough to my TDCJ Clients. Over the past year, I’ve helped nine other Brides who made similar mistakes before contacting me crying for help. I’m going to once again go over CLM, Informal Marriage Affidavits and the REQUIRED Formal Marriage License necessary for a Texas Department Of Criminal Justice Wedding. Yes, I realize the Informal Affidavit is cheaper than a Formal Marriage License. These are two completely different documents which is why they also have different fees associated with them. It’s not a choice for TDCJ Marriages however. I will explain why one won’t take the place of the other momentarily. A Prisoner cannot change from Single to Common Law Married after incarceration. Period. 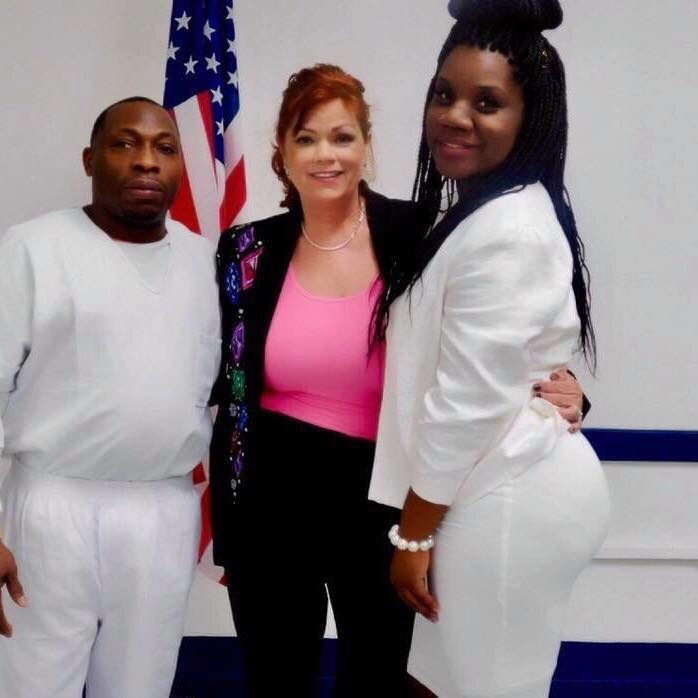 If they weren’t living with you prior to living in Prison, they didn’t suddenly begin living with you once they had been incarcerated. An inmate can change from Common Law Married to Single but not Single to Common Law Married. I get so many phone calls and emails about this scenario that I’m bold typing the reasons. Once incarcerated, an inmate CANNOT change his or hers status to Common Law Married aka CLM. Why? Because an inmate lives in the prison and the other party does not. Common Law Marriage means that BOTH PARTIES LIVED TOGETHER PRIOR TO INCARCERATION. Being CLM inside TDCJ does not constitute being considered CLM outside of a Texas Prison. This status is for TDCJ records ONLY. Unless of course, PRIOR to incarceration, both you and your partner filed an Informal Marriage Affidavit at the clerks office TOGETHER. 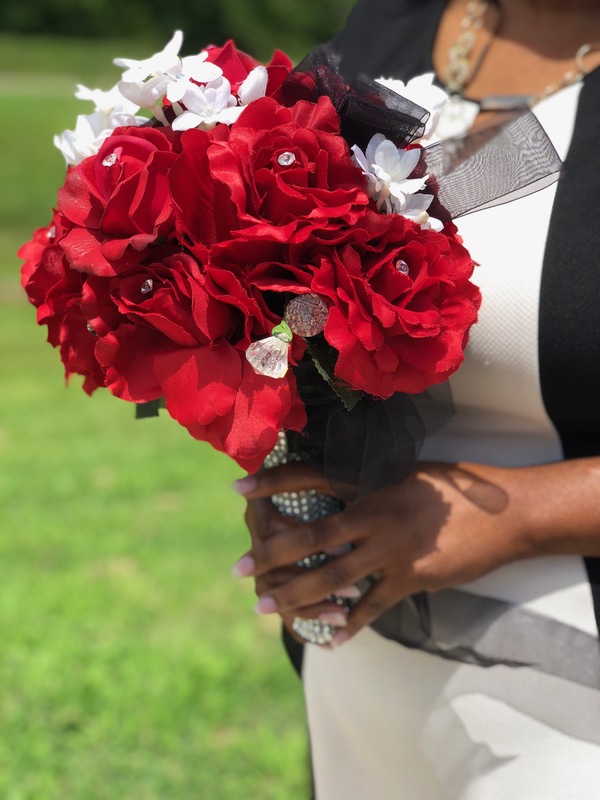 In order for a Common or Informal Marriage to be recognized as legally binding, both parties must appear in person and file an Informal Marriage Affidavit together at the Clerks Office. Obviously, when one person is in prison, they aren’t going to join you at the Clerks Office. You also cannot use an Absentee Affidavit for an Informal Marriage. Because of this, filing an Informal Marriage Affidavit isn’t any option regarding TDCJ Marriages. 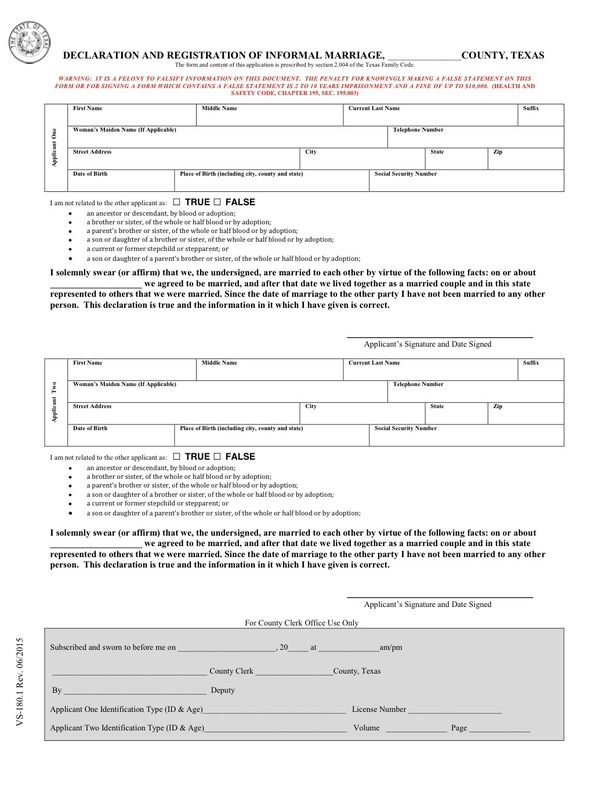 The form for CLM Status at TDCJ is remarkably different from an Informal Marriage Affidavit. To give you TDCJ Clients a view of the differences regarding a state issued Informal (Common Law) Affidavit, I’m adding an example below. The Clerks Office Affidavit carries the seal of the state on the document. Although a TDCJ Document requires a notarized signature, it is used for TDCJ Records ONLY and does not carry the same authority outside TDCJ. 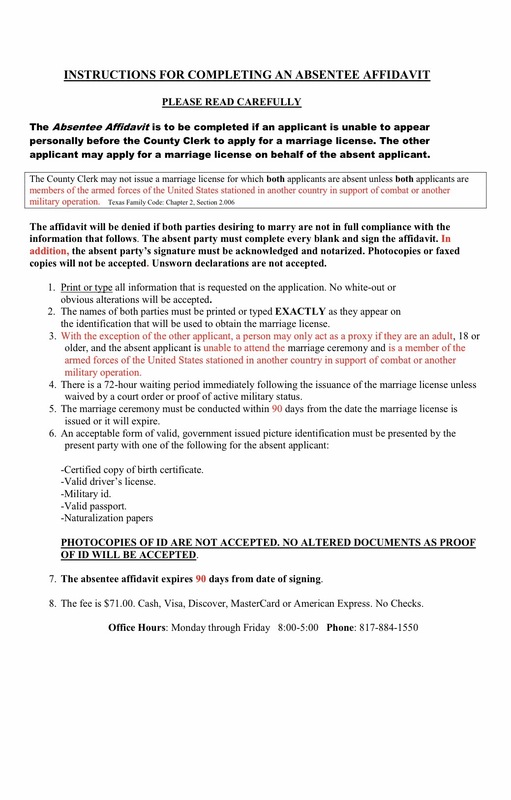 What this means is that although you may have filed a CLM at TDCJ, such a Marriage is not recognized outside TDCJ. These “statuses” are strictly for Prisoner records. 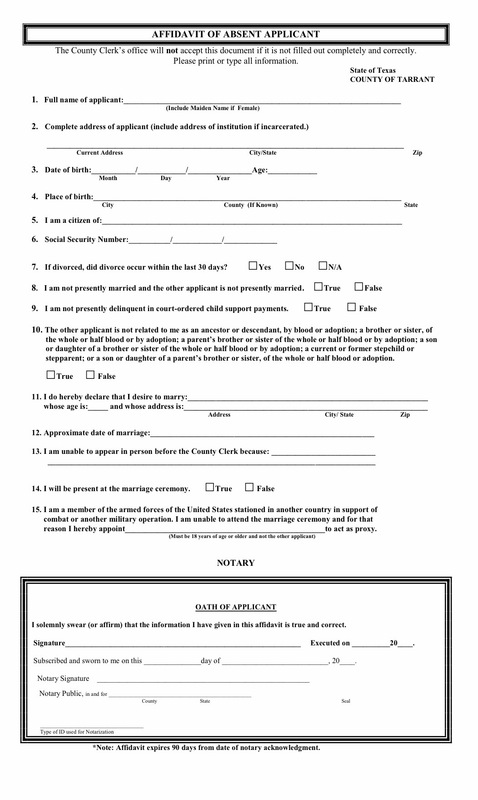 The Absentee Affidavit is REQUIRED to obtain a Marriage License because (obviously) the Prisoner cannot be present to purchase the Marriage License. The person on the outside purchases the Marriage License using a Notarized Absentee Affidavit and Notarized ID from the Prisoner. Without both, the Clerks Office WILL NOT issue a Formal Marriage License. Below is an actual Absentee Affidavit for your review. To better explain Texas Marriage Law VS TDCJ Marriages, please review my previous blog— Informal Marriage, Formal Marriage Application, Body Disposition Affidavits & More. 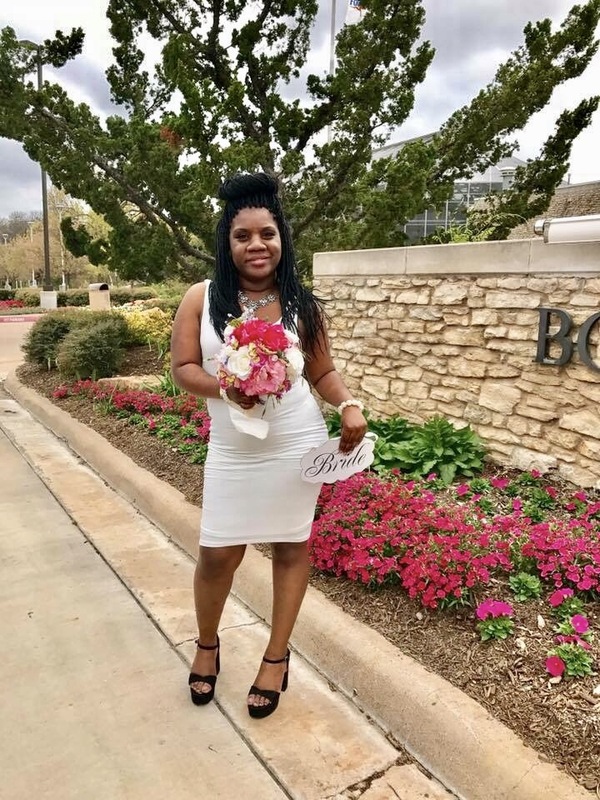 By understanding the differences, I’m hoping you have a clearer picture of why you cannot use an Informal Marriage Affidavit for your Texas Wedding. Obviously, you and your partner cannot appear in person to file such a document together when one of you is incarcerated. 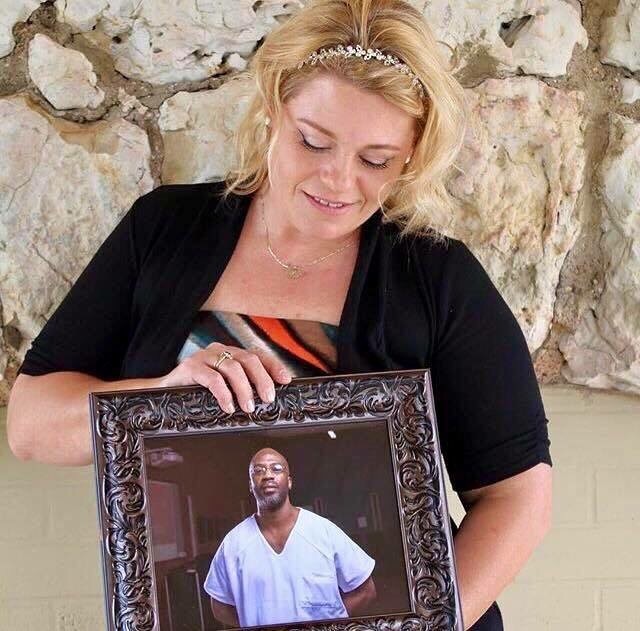 Running to Prisons all week between visits to Psych Wards has become so common for Cindy and I lately that “breaks” give us a moment to think about clients rather than our family. At 5AM tomorrow morning, we are loading up Makenna, Leigh Ann and baby Madyson to drive to Hodge Unit for a family road trip and break from the drama in Fort Worth. Yep. We are looking forward to 70’s music, truck stops, old junk shops and some fun for a change. The drive to TDCJ Hodge Unit started at 6AM this morning transferring Maddies car seat into my SUV along with my other family members. An hour into the drive, my cranky riders wanted to stop for breakfast at McDonalds. While waiting for our to go order, Cindy (as usual) inquired about whether the coffee was fresh. This is a query everywhere we go. If it isn’t fresh- we are all going to hear about it. I’m in my SUV everyday working and traveling to meet clients but, bacjriads acrosd Texas rarely have a Starbucks nearby. Making a few of our usual pit stops, the reason I leave far earlier than necessary is based on unknown road construction and other surprises. Arriving at Hodge Unit, my bride looked beautiful in a dress that would perfectly match both bouquets that I had packed on a whim. After leaving the Unit, I told Mia to find an area for her bridal shoot near the Unit. My niece, Leigh Ann (below) had joined me on this road trip to a Texas Prison. Of course, baby Madyson joined us on our road trip too. Since everyone asks if they can wear a wedding dress, the answer varies from Unit to Unit. At Estes Unit, my brides dress was spandex and tight. Tight or see through clothing goes against the visitation code. If you feel your attire is too revealing, it probably is. It’s best to wear clothing that covers cleavage and isn’t too tight. Having your wedding ceremony canceled due to innapropriate attire is something you don’t want to happen. 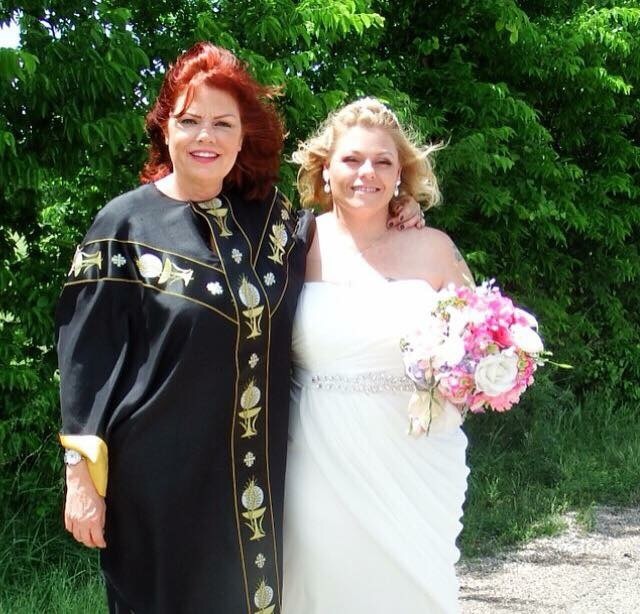 The visitation dress code applies to TDCJ Weddings. However, in the event your attire is deemed too revealing, I bring a variety of jackets and scarves with me as a courtesy to clients since I have no idea what they are wearing until meeting them in person in a Prison Parking Lot. To overcome the “underdressed issue” of my bride at Estes Unit, I loaned the bride one of my suit jackets to wear inside the Unit. Once outside the Unit and on location for her bridal shoot, she removed the jacket. Since I’m asked about rings for Texas Prison Weddings, there are no ring exchanges allowed. Many of my TDCJ Clients opt for tattoos. The Administrative Directive strictly forbids ring exchanges with Inmates. You cannot bring a ring into the Unit, clothing into the Unit or anything other than your state issued ID, Marriage License and car keys. If your loved one is behind glass at visitation, they will also be behind glass for their wedding ceremony. 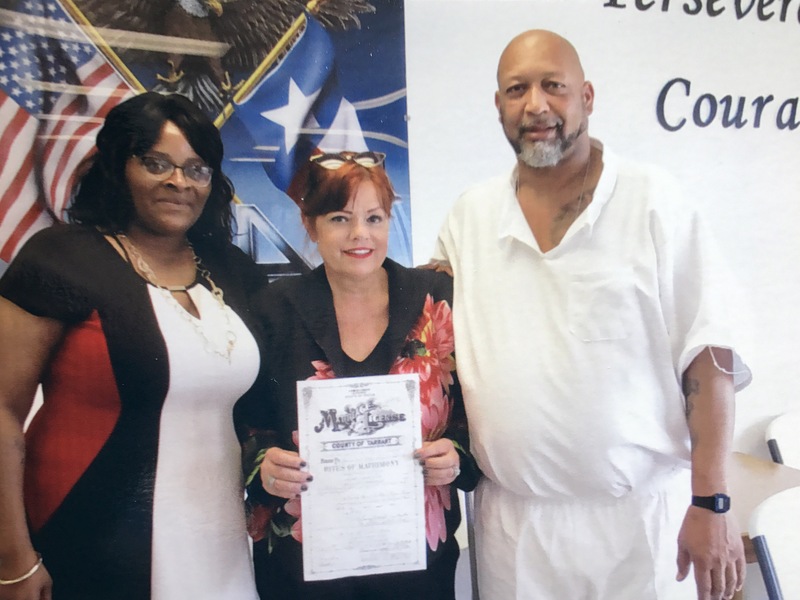 The inmate can both hear and understand the ceremony behind the glass but, a kiss at the end of the ceremony will not be an option. 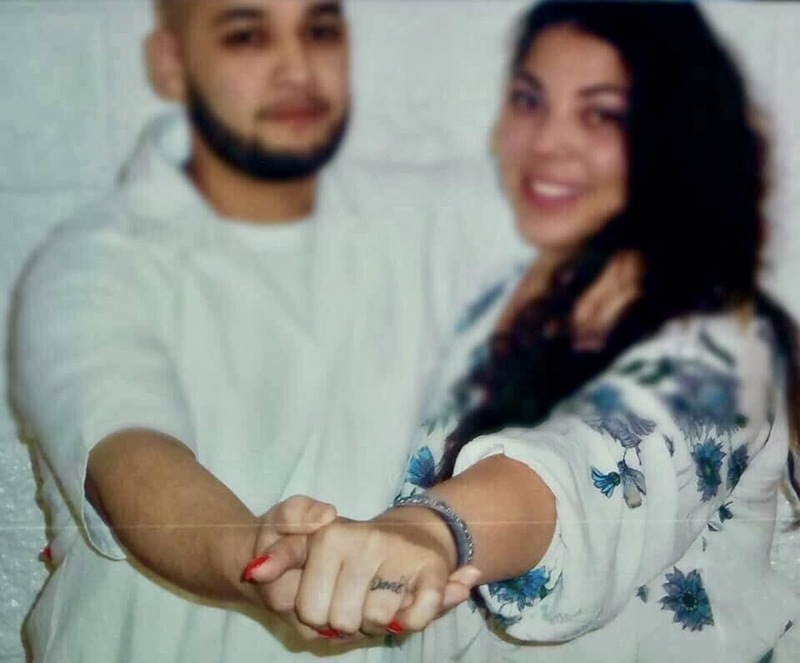 If a Unit is privately owned, they may or may not allow Unit Photos if your Prison Wedding. Please ask Unit Chaplains whether Unit Photos are offered at your Texas Prison Wedding. My niece, Stephaney called last night from treatment. She was crying and upset while playing the victim again and telling us we didn’t love her. I calmly explained that her mother and I are exhausted from her choices. Our husbands are exhausted about seeing both of us running off to another jail to visit her or Psych Ward. We need her to accept that it’s time for her to support herself and realize we aren’t going to save her again. This is upsetting for her to realize. The usual guilt trips that bring us running to the rescue are over. At 31, Stephaney is upset that transitional housing is $600 a month. I argued that an apartment and utilities are far more expensive. Neither of us are going to rent her an apartment and saddle ourselves paying her rent. Of course, my niece used the old “you don’t love me” routine. Truthfully, it’s time that my niece starts loving herself. I will take clothing to the treatment center for her but, we will not and cannot continue to pay her bills and beg her to go to work. Either she goes to work and pays transitional housing rent or, she becomes homeless. It’s shocking to me that we are now numb to her manipulation but, we are. Our focus is on the twins and our clients, our futures and our husbands. We must now stop blaming ourselves for Stephaney’s choices because they never were our fault to begin with. Accepting this finally after all of these years is a liberating reality for not only her mother but also, me. When you juggle Clients from four different businesses and over the last year, visits to Psych Wards for three different family members, keeping track of ID #’s is only one of the many problems you face. For all of my dedicated readers who have been through The Merry Go Round of mental illness and addiction reaching out to share similar experiences, God Bless You and your patience. I pray you find peace every night. It’s not easy to show up for work with your happy face on. You are a warrior who hides your pain and sorrow from coworkers and friends. It’s not an easy journey. I’m back at Estes Unit Friday afternoon when we leave our Family Group Meeting at Mesa Springs. Hopefully, Maryssa’s treatment has progressed enough for her to be released. Her twin, Makenna misses her and Maryssa misses being home. Maryssa is learning coping skills for her anger and we are praying for some peace.